A newly-appointed regional daily editor has urged readers to help tell him where the newspaper is going “wrong”. In an appeal to Norwich Evening News readers, David Powles, pictured left, posed the question “what makes a good newspaper?” in his first week in charge. 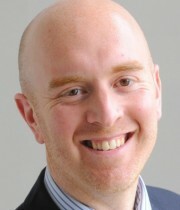 As revealed on HTFP on Monday, David has been appointed to the editorship of his hometown newspaper after previously serving as head of publisher Archant’s central investigations unit. David’s new role was previously overseen by Eastern Daily Press editor Nigel Pickover, but has now been revived as a standalone post four years after it was axed. Writing in yesterday’s edition, David told readers: “My first task as editor of the Evening News is to make an appeal to you to let me know where we go wrong (and hopefully where we go right) when producing the paper and its website every day. “It is an absolute honour and a privilege to be asked to take over the reins of the paper for the city where I was born, spent much of my childhood and have enjoyed living for the past ten years. “A dream come true in fact and one that has existed since I was 16 when a local journalist came into my school and talked about a career which sounded so rewarding, important, interesting and above all fun. And fortunately that is how it has turned out. “Good quality local journalism can still make such a difference to the community it serves and that’s what I hope the Norwich Evening News continues to do for as long as I am in the hot seat – make a difference. The Evening News editor post is the second such role to be recreated by Archant in recent weeks following the decision to resurrect the Ipswich Star editorship as a standalone role. Jeeeez, there’s no point in asking the few readers they have, he should ask the many thousands who’ve walked away from this once credible paper( I have a long memory!) and the countless local businesses who no longer see the NEN as a credible advertising medium now using other independent local competitors instead, however if we need to point this basic fact out to him it doesn’t bode well for the future does it? It’s apparent that this is a holding role while they migrate to on line only, go free or merge with the equally awful free Norwich city advertiser. As far as the city concerned they might just as well close it altogether and save costs. So he’s thrown in the towel already? No wonder editors are dropping like flies. Charlie Brooker wrote that ANY reader who got in touch, be it good or bad, was a (insert gratuitous and unprintable insult here). Horrible thing to say, but there is a grain of truth in it. Happy readers just get on with enjoying the paper/website. They don’t waste their time contacting people they don’t know to give them advice or praise. “Dear Mars, that was a particularly good chocolate confection I enjoyed in Beccles today….” I’m afraid the response to this editor’s appeal will mostly be negative and from time wasters with axes to grind. He’s better off following his own line, talking to his staff, pinching and adapting other good ideas, and providing an antidote to the rather pompous EDP. Good luck, and I mean that. “what makes a good newspaper?” If he doesn’t know, perhaps he shouldn’t be an editor. The Liverpool Echo editor asked readers the same question before relaunching the title last year. A significant number said they wanted “more positive” news. So the paper tried this for a few weeks, lost sale hand over fist and quickly went back to leading with crime and death. what a bunch of cynical bores you are. I imagine you all threw in the towel and pocketed your pensions some time ago. One way to improve a paper is to get readers in to the front office. I don’t know the set-up in Norwich, but my town’s weekly paper (now owned by TM) lost its front office some years ago. Its newsroom is on the first floor of a back street office block, the main entrance to which is locked, so readers must have an appointment in order to see a reporter (if reporters they have). There’s a notice on the front door telling people how to place BMDs and contact the ad department, but there are no contact details for editorial. When he discovers where he’s going wrong, perhaps he can pass the information on to the Trinity Mirror policymakers. Give the guy a break, FFS. The country’s awash with redundant editors so this guy clearly does know what he’s doing or he wouldn’t have got the job. The ‘how can we do better’ tactic isn’t such a bad idea as it introduces him to his readership as an open-minded and approachable bloke. But I agree with Bluestringer, the last thing he should do is listen to what they say. Bin the fluffy stuff! @Grim. Bit unfair that. There are some good points here, made from experience. Nothing wrong with that. Bluestringer is right about the Liverpool Echo and any other paper that has tried the “good news” approach. Another favourite – and I have seen it many times – is editors who want to curry favour with the execs coming back from asking readers what they want with the answer “MORE BUSINESS NEWS!”. You can just imagine readers clamouring for more of what’s going on down at the industrial estate or stories about new junior appointments in the financial services sector. Let’s see what this process digs up. I’m with Grim. There’s nothing wrong in asking readers what they’d like to see. Of course not every idea will be acted upon – but what’s wrong in asking your customers their thoughts? If they feel they have a positive rapport with their local paper, and that their views matter, that’s a very powerful tool. Don’t listen to the cynics, David. The very fact the question has to be asked at all is revealing. It suggests a publication that has become isolated from its readers and is lacking leadership. Editors paying attention to what their readers want is, I’d have thought, a good thing. The alternative is what, exactly? It’s not for the few readers who’ll see this message to tell him, he works there and must have an idea of what’s wrong, it’s for him to tell his peers what’s wrong,what’s needed,a chance to outline his plans,to seek assurances about the long term future and viability of this paper and to insist on serious investment and upscaling of the staff if they’re expected to deliver the goods. If he doesn’t feel able to make the call and has to ask the few readers who remain,he shouldn’t really be taking the role. Then again maybe they’re just after a stand in until the longer term plans are revealed which may not include the continuation of this ailing title as a newspaper publication. Now if there were enough local reporters out on the patch in pubs, clubs, streets etc gathering news in notebooks (yes, they used to do that!!!) instead of e mails they would already know the answers. Local journalism is so cold and clinical now. But good luck to him, anything is worth a try. Why ask the few who already buy the paper as presumably they’re satisfied (?) and you’ll learn nothing. Cynicism and disregard for readers is what did for the regional press, not the internet. Dave’s a great journalist, knows the city, and has landed – not a moment too soon, either! – a job he will do brilliantly. Thankfully, I’m sure, he will pay no attention to the naysayers who still hark back to the “how many ems in mammoth?” days. Staggering that the content manager is on here asking for advice now! How many of the handful of the papers readers who will see this fawning message (or ‘desperate cry for help’ as its known today around the place )will bother to respond? Those that do will presumably say it’s ok ‘because they already buy it’ which will tell him nothing. ‘The alternative’ ( as so many have pointed out on here already ) is to ask those previous buyers why you STOPPED buying it ? And to ask the non buyers why you DON’T buy it? It’s not difficult is it! What will happen when they are inevitably told that the News comes out far too earlier and competes with the EDP? Will the Archant suits go back to providing Norwich with a proper evening paper? As one former reader, I shalt not be holding my breath. My door is always open. If you want to be effective members of the business that pays your salary, come by and discuss. No need to live in fear on here! That’s a good offer for career progression from Matt Kelly with the implied criticism/threat that you cannot be an effective member of the Archant workforce if you point out the blatantly obvious on HTFP. As I said on the other thread Powles’ plaintive cry is an ‘Alamo’ defence aimed at retaining the remaining readers, no more than that really. The bigger picture as others have said is how long the EN can continue with a readership of 10,000 before it becomes uneconomic to publish in printed form. Below 10,000? 9,000? 8,000? Less than that? The arguments about why local newspapers have lost circulation are well ventilated and no doubt mistakes have been made. Some are holding up better than others but largely, the race is run. However, with regard to the EN being sold in the morning alongside the EDP, the management at Archant made that decision alone. I’m convinced I still see the odd delivery boy on a bicycle in Norwich shoving the EN through letter boxes at around 6pm. This may be a ‘ghost’ delivery boy of course but perhaps someone at Archant can confirm whether this still happens. If it does, what that means is that there are still some readers, probably elderly who are still prepared to receive their newspaper at a time when any news in it would have happened at the very best, nearly a day and half before the paper lands on their doormat. Do these people even realise this? It’s either a grand deception perpetrated on the readers or some sort of inertia on behalf of the remaining readers. It’s the old ‘toe the line’ ‘get on the bus or get out’ mentality with anyone questioning decisions being deemed negative that is endemic in any yes man culture, a throw back from the days of staff being told they should be grateful to have a job. As an ex employee and ex reader might I give my opinion? When it was a popular paper it was full of the day’s news, opinion, comment and features with a useful level of advertising and even the tv listings for the evening plus it was on sale late afternoon meaning the content was very up to date and contained genuine ‘news’ being the only place to read the kind of local news the Nationals didn’t cover. Move the clock on and we have so many other news reading alternatives,from instant updates and feeds on phone iPads and tablet,headlines and breaking news on our pc ,running news bulletins on social media and all constantly updated and available free,live and ‘as it happens’ often with video or online links to the news piece making the purchase of a paper that’s on sale first thing in the morning pointless. Couple this with stale news from the previous day or what’s already been read on social media, increased cover price and a general dumbing down of the whole thing and you shouldn’t be surprised to find your readerships gone and the copy sale numbers are on the floor. With costs ever increasing and presumably revenues not covering costs,or at least not being profitable ,one wonders why anyone would persist with something that so few people want? And yes concerning to see the menacing tone of the reply to those people pointing out what should be blatantly obvious to anyone directly involved with the paper and no word of thanks or acknowledgement for their albeit, frustrated input but that’s what you get when you operate a yes man culture. The thing is that the community that once regarded the Evening News as part of the family has changed – no longer the over-the-fence gossip or discussion down the pub about local politics. Norwich, as with everywhere else, has changed over the last 30 years – new people coming in so no association or ties with the city, get their news and events from mobiles, too busy to gossip and down the gym with their earphones instead of the pub. It’s not that anyone is doing anything wrong, it’s that the people have left the old ways behind. Matthew Kelly would have been better off questioning the incoming editor about his plans in depth ( which you’d assume he already has) rather than belittle those pointing out the obvious alternatives which should be apparent. Slightly belated perhaps but congratulations Dave. It’s good to see someone who has climbed through the ranks being given a decent opportunity for a change. There’s no doubt Dave has put the hard yards in – more so than many in lofty positions at Archant Towers. There’s no disgrace in asking readers what they like/ want. It doesn’t mean he can deliver what they want but asking is a good starting point and a way of keeping onside with the existing readers. Of course David has his own plans as well and it will be interesting to see how much licence he is given and what direction the Evening News, so long starved of resources and investment, takes. My advice would be: instead of turning your reporters into desk jockeys, get them out of the office and on the ground where it counts. Keep an eye on Twitter/ Facebook and the web but don’t become obsessed with it. The best stories – and he should know as head of the investigations unit – are the ones that aren’t plastered all over the web in open play. Good luck to all on board. It does come over as a bit desperate … that said, for years in this industry we’ve heard cliche after cliche spouted as ‘fact’. All backed up with nothing more than hunches in a period when circulation has plummeted. I think the problem is that if/when he gets the answers, the bean counters will say he can’t do it. Biter – the news may have happened days before the paper has been put through the box but has the reader read it anywhere else? Surprising how much news there still is that’s not online that’s nowhere till it is in the paper…..
Best thing they could do in my opinion as an ex staffer and thus an ex reader ( I wouldn’t pay for it) is to go free or merge it with the weekly Norwich ad grabber,however the more obvious route and one I’m sure the bean counters would prefer is to close it altogether, it’s lost it’s way and lost its audience and no amount of money thrown its way will bring them back.